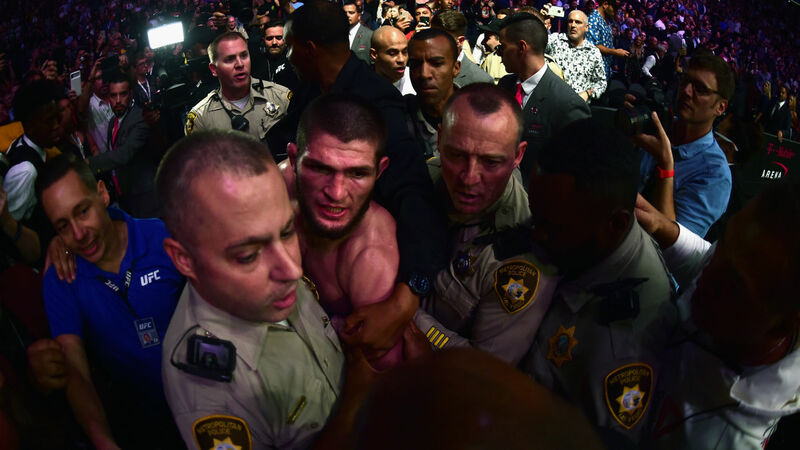 UFC 229: Khabib Nurmagomedov ruined the biggest night of his career — or did he? LAS VEGAS — It was easily the biggest event in UFC history, but it will also go down as its most infamous. Khabib Nurmagomedov’s fourth-round submission of Conor McGregor to retain his UFC lightweight title won’t be how Saturday night’s UFC 229 is remembered. Derrick Lewis’ epic come-from-behind knockout of Alexander Volkov and hilarious postfight interview are already distant memories. Tony Ferguson and Anthony Pettis had a Round of the Year contender in their scintillating co-main-event clash; unfortunately, that, too, has become an afterthought. What UFC 229 will be remembered for is one of the most sickening scenes in MMA history when Nurmagomedov jumped out of the Octagon and started a brawl after winning the biggest fight of his career. This could have been Nurmagomedov’s moment in the sun. All he had to do was keep his emotions in check. Understandably, that was a tall task for an individual who had to endure a number of insults about his family and religion during the buildup to this fight; however, a professional fighter with everything on the line needs to avoid being involved in a debacle that will overshadow his greatest MMA moment. Nurmagomedov submitted the biggest star in combat sports today. The result could have boosted the Dagestan fighter’s popularity to new heights and opened avenues to rake in earnings outside the Octagon. Instead, he tarnished his character and is now facing legal action, a possible suspension and possibly being stripped of his title should the Nevada State Athletic Commission choose to pursue the harshest punishment. Nurmagomedov can take pride in retaining his title against his arch-nemesis, but he left a lot on the table with his actions. Some of his teammates will no longer be able to fight in the UFC after the incident. His future is in question. Was it worth it? Maybe. Nurmagomedov has a point. The trash talking between the two sides went too far and it clearly got under his skin. Tensions were high even after he forced McGregor to tap out, and once he spotted Dillion Danis — McGregor’s jiu-jitsu coach and a man known to talk trash — all bets were off. Do you know what else was “disgusting”? The bus incident being kept on a constant loop to promote this fight. White wouldn’t do anything differently if he had to do it all over again, either. With that in mind, one has to wonder whether this incident will be used to promote what would be a monumental rematch between the two. If controversy is the fuel for success, then there’s more than enough to power this jet to historic PPV numbers. Obviously, many hurdles need to be cleared before the UFC can even consider a rematch. Fines and suspensions will be handed out to all involved parties first. Once that is taken care of, though, you have to believe that the company will stage another match between the two sides because it is easily the biggest fight that can be made in the sport. Like the McGregor bus incident, Saturday’s brawling is bad in the short term but serves a greater purpose. Nurmagomedov sullied his name on the biggest night in UFC history, but that can be overcome. Perhaps this will make him the biggest villain in the business, which could carry far more value heading into a second fight. Bad guys have value and Nurmagomedov is arguably the most valuable bad guy in the UFC. So, the question is posed again: Was it worth it? Maybe not now, but, yeah, it probably will be.